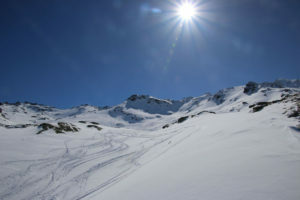 Val Thorens is the highest and largest ski resort of Les Trois Vallées Ski Region – the biggest interconnected skiing in the world. 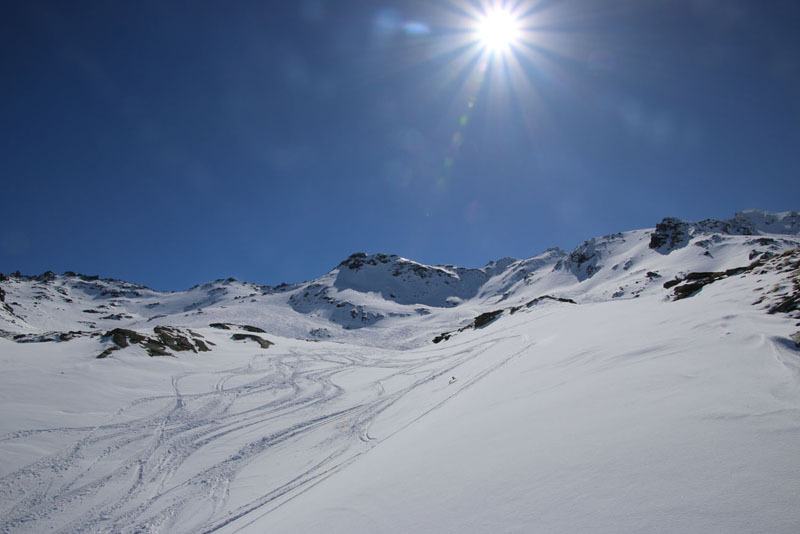 Val Thorens is at the far end of Les Trois Vallées, closest to Italy, south west of Méribel and Courchevel. There are actually 4 valleys in Les Trois Vallées, when you include Orelle which is part of Val Thorens skiing – for a combined 8 resorts, 25 summits and 166 amazing lifts. Val Thorens terrain is huge, all above tree line, with prepared (groomed) trails on eight peaks between wide open bowls and ravines. Val Thorens is super scenic if not charming and quaint. Trams, gondolas, six packs and every configuration of lift launch in every direction up every aspect of the valley. Families will find navigating all this immense interconnected terrain challenging at first, but its rewarding as well. All part of your 3 Valleys ski pass, from Val Thorens you can easily reach Méribel or Courchevel in a few lifts rides, or just explore all flanks of Val Thorens extensive valley of terrain stretching to Saint Martin de Belleville and Menuires to skiers right, or Orelle – the 4th valley and highest point at 3 Valleys (3230m) in the opposite direction. Here is where you find La Tyrolienne – a crazy zip line descending peak to peak a whopping 4,300′ in a swift 1 minute 45 seconds from the top of Orelle. Try that for some family excitement. The views from Val Thorens of over 1,000 other Alps in France, including Mont Blanc at 15,774’, and nearby Italy and Switzerland are dramatic on a clear day. When its dumping snow its hard to find definition without any trees, read white out. Val Thoren’s has 150 kilometers of daily prepared ski trails, plus endless off-piste skiing. Hire a guide to explore Val Thorens high alpine off-piste terrain because there is also high avalanche and crevasse risk even though the slopes are so easily accessible by lifts and a short traverse beyond the trails. The lower elevation ski areas are more mellow within “ValT” at Les Menuires (1850m) and Saint Martin de Belleville (1450m). You can’t miss Les Menuires, you will see the big utilitarian 70’s style bunker hotels, but the skiing here is well groomed trails on both flanks of the valley. 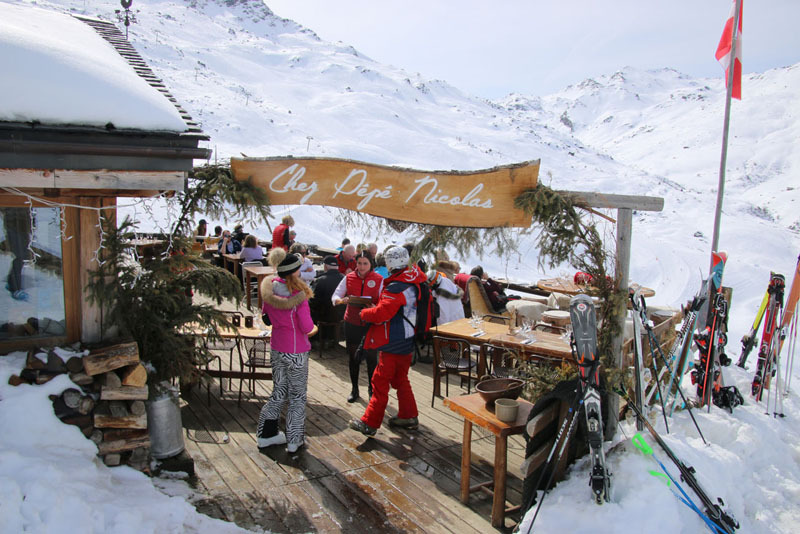 From here and the prettier French ski village of Saint Martin de Belleville, you are just a lift up and over to Méribel, and then Courchevel in the next valley, and you’ll find more charming on mountain chalets for lunch like Chalet Pepe Nicholas along the way. For family fun besides skiing, Val Thorens offers snow biking, snowmobiling, tobogganing, zip-lining, and Segway on snow. 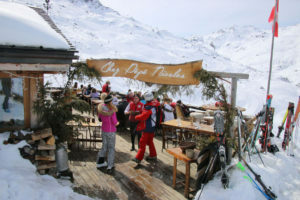 What Val Thorens may lack is classic French Alps cozy charm, its more modern (1970s vintage). For that ambiance, stay in nearby Méribel or Courchevel. What Val Thorens does offer: tons of terrain, high capacity lifts, a big ski school, stellar views and limitless off piste, plus lots of lodging ranging from affordable condos to several five star hotels. Where to stay on mountain with your family? At Altapura with the kids, or Hotel Pashmina for adults – where you can sleep in an igloo. 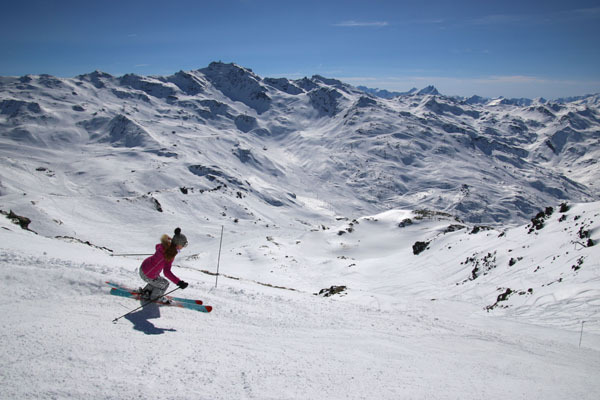 Val Thorens makes our Top French Family Ski Resort.